All major thoroughfares going towards the Bilawal House were sealed on Wednesday as around 200 protesting schoolteachers attempted to march towards it. They were representing the around 3,600 teachers who were appointed in June 2012 on the instructions of former education minister and a PPP stalwart, Pir Mazharul Haq, but later did not receive their salaries for the last two years. Pakistan Peoples Party’s (PPP) stalwarts have repeatedly urged the federal government to allow the Pakistan Tehreek-e-Insaf and Pakistan Awami Tehreek to organise protests in Islamabad’s red zone. The party, however, found itself at the receiving end of criticism on Wednesday as their provincial government refused this ‘right to protest’ at the Bilawal House for the second time in four months. The protesters’ movement was restricted to the Khayaban-e-Jami near Boat Basin. The Sindh High Court on Wednesday directed the home secretary, director general of Rangers, inspector general of police and others to submit their replies on a constitutional petition seeking the whereabouts of a school principal allegedly picked up by personnel of the law enforcement agencies. A division bench headed by Justice Ahmed Ali M. Sheikh also issued notices to the federal and provincial law officers and put off the hearing to a date to be announced later by the court office. Umair Anwer, represented by Advocate Syed Nadeem ul Haq, submitte d in his petition that LEA personnel, including paramilitary troops and police, picked up his father,Muhammad Essa Anwer, principal of the Aasanamal T. Ojha Government Boys Primary School in Lyari, on Aug 29 at the school. He said he approached the area police and higher officers of the paramilitary troops to get information about his missing father, but the law-enforcers feigned ignorance about his father`s arrest or detention. A private school near Korangi Crossing suddenly started reverberating with boisterous slogans on Tuesday morning. It wasn’t a political protest, though; a group of students was agitating against alleged discrimination in electricity supply to their classrooms through the school’s standby generator during the spells of power outages. With sweat trickling down their faces and their uniforms soaked with perspiration because of the hot and humid weather, the students left their classrooms and sat down in a paved open space outside the office of the principal. Their demand wasn’t extraordinary, but the approach they had adopted was. They termed their gathering a “dharna” (sit-in) to press the administration for addressing their complaint. Association of primary teachers P T Alaf protested in front of treasury office Dadu against the corruption of treasury office Dadu. Teachers said that the treasury office Dadu has fixed 30% to 40% bribe for all types of legal work to be done by them in treasury office. Representatives of the protest Mr Inayat Jamali, Mr Abdul Gafoor Laghari, Mr Allah bechayo memon and Mr Wasim Khokhar said that government of Sindh have issued notification of teaching allowance , six months ago, but, till now, treasury office does not issuing us allowance, on the contrary, it is taking too much bribe from each teacher which is totally unaffordable . They demanded from the Sindh government to take notice of it and issue the amount of their teaching allowance. Students of high school Khorwah protested, after some parts of roof fallen down during the running classes. Students said that due to ruined condition of school and lack of required teaching staff their study has been disturbed badly. In this condition, there is also life risk to continue study inside the building. Head master shared that six months ago, two students also got injured in the same situation. Teachers said, they also feel insecure while teaching in this school building, because, it has reached to an alarming situation. Head master and teachers said that they have informed to the department and have shared them the real situation, but, still now, nothing has happened. Representative of the protestors Mr Kamran Faizan urged from the government of Sindh to immediately repair the school building to refrain students and teachers from any big misshapes, and to appoint new staff the fulfill the requirement of school to smoothly continue the study of students. During the, roof of the first class demolished and created fear among the girls of the school. No injury and accident took place and all the students remained safe. When parents heard this, they rushed to school and took their daughters of their homes. District education department administratively is running on adhoc. In seven talukas of the district, OPS officers have been appointed. Both male as well as female SDO are also appointed on OPS. Clerks of the education department are the sole authority and are keeping all the records with them. Despite the order of the Supreme Court of Pakistan, OPS officers have not been returned to their real positions. Shortage of 18th grad officer, charge has been given to non gazetted officer in the district, Mr Minthar Buriro, district officer education said. Schools of taluka Majhand have been turned into dairy farms, storage of grains and otaq by the influential persons of the area. Teachers never turned to schools and are enjoying free salaries and leisure time. Political back up have encouraged teachers to get salaries without performing their duties. Politically interference has made education department of district Jamshoro unproductive and less effective. It is an alarming situation that the charging of EDO has been given to Mr Mohammad Ayub Mallah who is actually in 16th grade. All funds of SMCs have been badly mismanaged. Parents, students, social and political workers of the area have demanded form the authority to take notice of the destruction of education in the area. Ms Parveen Jamali while conducting press conference in Khairpur Nathan Shah, district Dadu, has said that SDO female has illegally taken away SMC funds of 184 schools and continuously bothering female teachers in Taluka Khairpur Nathan Shah. As, she is already appointed on OPS. Parveen Jamali further said that about 90% of girls school of taluka are closed and teachers have been taken monthly for not going to teach in the schools. SDO female Farzana Chandio is a sister of PPP MPA Nasreen chandio. She further blamed on SDO female that she has given fake orders to many female candidates and has received huge amount for it. She demanded from authority to take notice of that open corruption and to take immediate action for the promotion of girls education in the taluka. 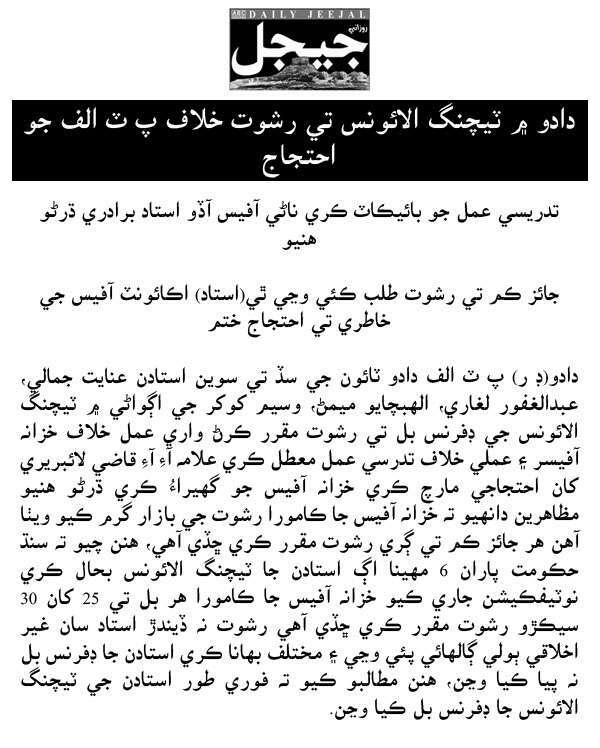 Mr Gahwar Laghari, DCO larkana reached to girls’ high school Nao Dero and inquired about the news of shortage of roofing fans and female staff, published in the newspapers, couple of days ago. Head mistress Ms Hasina Khuhawar of the school briefed him about the prevailing condition of the school and shared him that due to lack of teachers and rooms girls of different classes are taught in one room. She further said that she has sent many complain to authorities but no one is listening and paying heed towards it. At the end DCO visited the class rooms and assured the head mistress for solving all the issues immediately. Workers of Qami Awami Tahreek protested in front of the press club Mehar against the mismanagement of SMC fund of the primary school Syed Pur of taluka Mehar. They demanded immediate inquiry of these funds and warn that otherwise the scope of the protest would be enlarged. The girl students have clinched top positions in Bachelor of Science (BSc) and Bachelor of Arts (BA) examinations results announced by Hazara University here on Wednesday. “I am pleased to announce BA and BSc results and this time too girl students have secured top positions in BA and BSc,” Dr Manzoor Hussain, Controller of Examination, told a press conference. Dr Hussain said that overall passing percentage in both groups remained 40 as a total of 24,462 male and female students had appeared collectively in the examinations of whom 9947 were declared successful. The PTI leader said according to an ISAP report, over 40 per cent of the Punjab schools lack basic facilities, hundreds of vacancies of teachers are lying empty and over 70 per cent students failed to pass their annual exams. Education makes Humans a better Citizens of the Society said by Shiekh Afzal he also added that parents need to focus more on their children Education. The country’s performance in terms of health and education is among the worst of all the countries covered. Infant mortality (137th) is the highest outside sub-Saharan Africa and with one of the lowest enrolment rates in the world (132nd) is the estimated that almost a quarter of children do not go to primary school. Pakistan’s competitiveness inefficiencies in its labour market ranks 132nd, up six. Female participation in the labour force is the world’s fifth lowest (140th). The potential for ICTs not sufficiently leveraged remain low (114th). On a slightly more positive note, Pakistan does comparatively better in the more advanced areas captured by the GC Index ranking 72nd in the financial development pillar and 81st on the business sophistication pillar. Schools and colleges in Islamabad Capital Territory (ICT) reopened on Wednesday after a three-week delay caused by ongoing protests. The educational institutes were supposed to open on August 11, following the end of summer vacations, but the ‘vacations’ were extended four times because many institutes were housing security officials brought In to reinforce the Islamabad Police. Initially around 60 education institutes were handed over to cops from AJK, Punjab and the Islamabad Police. Later, the Capital Administration and Development Division wrote a letter to the district government and the Ministry of Interior asking for the buildings to be vacated so that academic activities can be started. The reopening does not apply to all schools, as 27 are still occupied by the police. The International Islamic University (IIU), Islamabad, signed two separate MoUs with the Al-Imam Muhammad Ibn Saud Islamic University, Riyadh, in the field of Information Technology and Languages respectively. The first MoU was signed by IUI President Professor Ahmed Yousif Al-Draiweesh and Dr. Waleed Al-Jandal, Dean of the Information Technology. The MoU will pave the way to get progress and achieve excellence with cooperative endeavours in the field of Information Technology by sharing expertise and skills from both sides. Students of Army Public College of Management Science (APCOMS) have filed a petition before the Islamabad High Court (IHC) contending that the said institution wasted their four years as they were enrolled in its Engineering Department but later they came to know that APCOMS was not registered with Pakistan Engineering Council (PEC). Instead, it was affiliated with a language learning institution National University of Modern Languages (NUML). Justice Athar Minallah of the IHC Wednesday summoned chairman PEC and its registrar directing them to appear before the court and submit reply by Sept 15.